Since I hand dye each item, I can customize the colors, design, or size to what you want. Email or call me to discuss details. 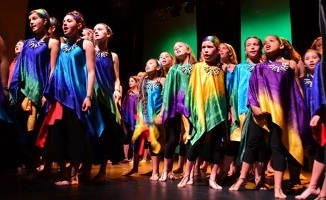 For several years I dyed headbands, sashes and ponchos for the Voena choir in California, in bright rainbow colors. They looked amazing on stage! Mountains are a favorite subject. 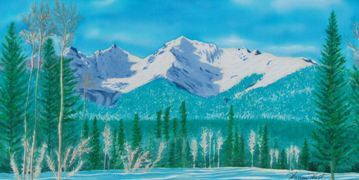 This painting of a mountain in BC was from 3 photos sent to me. If you have a photo you'd like a silk painting of, email it to me. 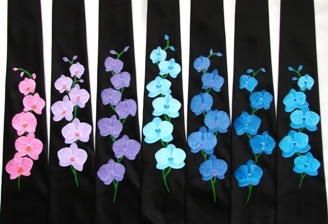 These black ties with orchids on them I painted for a wedding. Also I have dyed scarves in various colors and designs for bridesmaids, also as gifts for convention delegates. 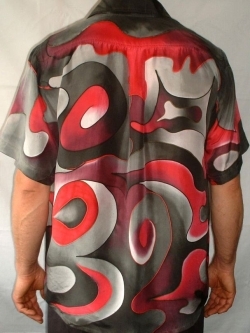 Here's a red, black and white swirl pattern Hawaiian shirt I dyed with a custom design.